ACTION: Captain Fewoini Baume leads a group from Trinity Catholic School who are gathering with other students tomorrow to join global #ClimateStrike calling for urgent political action on climate change and the Adani coal mine. HUNDREDS of students from Lismore and surrounds are going on strike from school on Friday to call on our politicians to take urgent action on climate change and stop the Adani coal mine. They will join the tens of thousands of Australian students from hundreds of schools plus students from around the world in co-ordinated strikes demanding urgent political action on climate change. Arky Ryall, Year 11 student from Trinity Catholic College Lismore said: "It's really important to me that we look after our planet, because I'd like to have a future in a world as beautiful as this." School students will be joined by adults who they have invited to walk out for the day in solidarity. The broader Northern Rivers community has rallied behind the students for this strike. So far, local community groups which have endorsed the event include: Gasfield Free Northern Rivers, Doctors for the Environment Australia, Lock The Gate Alliance, Climate Angels, Grey Power Climate Protectors, Knitting Nannas Against Gas, as well as various union members. 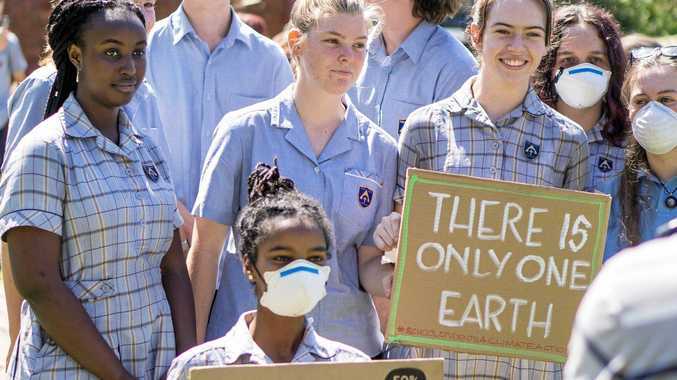 The Lismore School Strike 4 Climate starts at 10am at the Lismore Quad on Friday, and will include passionate young speakers, musicians, and a panel of experts including State and Federal candidates and scientists. There will be a march around the CBD footpath at midday. The Australian school strike movement was kicked off last year by Year 8 students in Central Victoria who were inspired by 15-year-old Swedish student Greta. Last November, 15,000 Australian school students, including 350 in Lismore, walked out of school, prompting ire from PM Scott Morrison.